A low, rounded shrub with narrow, gray-green leaves. 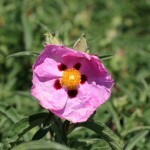 Blooms in late spring with large, rose-purple flowers with maroon spots at the base, and yellow stamens in the center. The flower is papery in texture. Drought tolerant once established. It prefers full sun and a well-drained site. It is generally tolerant of ocean breezes, salt spray, and desert heat.